● Key provision: Would ban the state from implementing the Common Core State Standards and Arizona's College and Career Ready Standards. Gov. Doug Ducey urged the State Board of Education on Monday to review Arizona’s College and Career Ready Standards, saying the standards should be the state’s and not dictated by Washington. “Therefore, I’m calling on this board to review the English Language Arts and Mathematics standards in their entirety to ensure that our children are well-served by the standards you develop,” Ducey said while presenting his education agenda to the board. The presentation followed the governor’s appointment of five new members to the board last week, including Gilbert Town Council member Jared Taylor, a Common Core opponent. The standards have been a contentious topic in Arizona, with new Superintendent of Public Instruction Diane Douglas running on an anti-Common Core platform and some Republican lawmakers opposed to Common Core. Still alive at the Legislature are bills that would prohibit the standards in Arizona and eliminate the new AzMERIT standardized test. 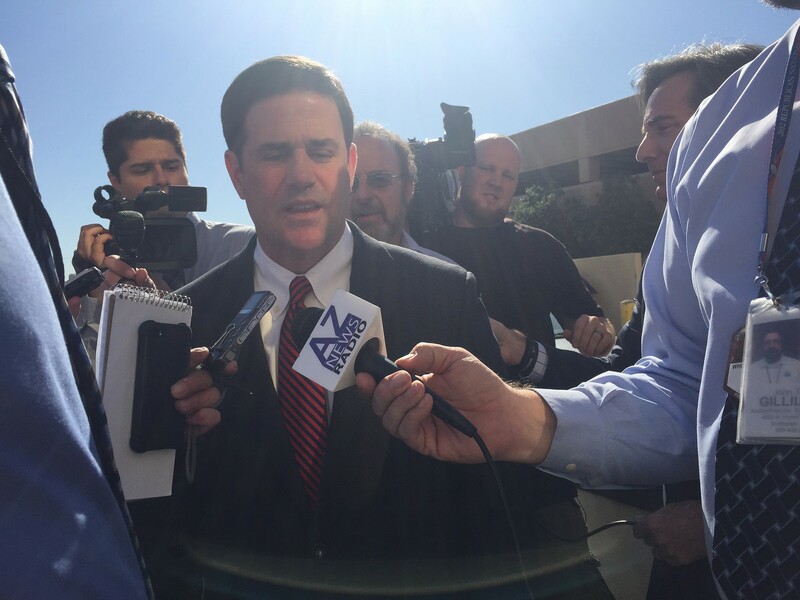 Ducey said his concerns about the Common Core can be addressed without a law. “I don’t think that legislation is necessary because we’re going to fix what’s wrong with these standards,” he said. Ducey said that some standards may not change in the review process, using reading and knowing multiplication facts by the end of the third grade as examples of standards that might be kept. “Where we have a standard and it fits and it’s necessary – that’s something that we want to embrace,” he said. Pearl Chang Esau, president and chief executive officer of Expect More Arizona, an education advocacy group, said the standards have had a positive impact on student learning. “We appreciate the approach to review them and not throw them out and start all over again,” she said following Ducey’s presentation. “Starting all over again would be an incredible waste of taxpayer dollars, but more importantly it would impede the student growth in academics that we’ve seen and there’s just no reason to do that,” she added. Ducey affirmed his position against the Common Core in his presentation. “As you know, I am against Common Core, and I think the federal government has vastly overplayed its hand in the way it has involved itself in this issue,” he said. Conservatives in the Legislature are continuing their attempts to kill the Common Core State Standards for education in Arizona. The latest bill has made it through a Senate committee and is awaiting action by the full body. It’s the same story with legislation targeting the state’s new standardized test. Gov. 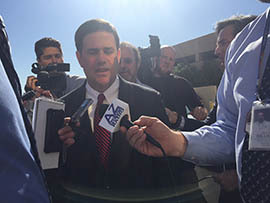 Doug Ducey leaves an Arizona Board of Education meeting on Monday after saying he wants a review of the state’s version of the Common Core standards.